Peter Hess, possibly born in 1703. Hans Conrad Hess, born May 3, 1705. Died in Ireland. Elisabeth Hess, born Oct. 21, 1708. Died in Ireland. Christian Hess, born July 14, 1713. Died in Mutterstadt. Hans Conrad Hess, baptized Aug. 19, 1714. Balthasar Hess (usually Baltzar in America), baptized Dec. 8, 1717. However, the Pfalz continued to be a poor and troubled region, causing many to move elsewhere. Many fled to Ireland. Almost 20 years later, Jeremiah and his family again left Germany. Jeremiah and his family settled in Salford in Philadelphia County, according to his will. By the time Jeremiah wrote his will April 28, 1739, Peter and Eva had moved to Maryland. Conrad and Baltzer remained in eastern Pennsylvania. Jeremiah died before April11, 1743, when his will was proved. (1) “Early Pennsylvania Pioneers from Mutterstadt in the Palatinate,” by Annette K. Burgert, page 11. Also in “The Palatine Families of Ireland,” by Henry Z. Jones Jr., page 63. (2) Anna is identified by Jones as the daughter of Hans Paulus Heim of Mutterstadt. However, Burgert, who checked the same records, doesn’t make that connection. (3) Peter, Eva, Conrad and Baltzar are listed in Philadelphia County Will Book G, No. 73, as cited in “Collections of the Genealogical Society of Pennsylvania, Vol., IV, Abstracts of Philadelphia Wills, Part II, 1726-1747,” page 823. A facsimile of Jeremiah Hess’ will appears in “I Shook My Family Tree,” by Thelma (Hess) Parsons, pages 170-171. The birth dates come from the Mutterstadt church books, as cited by Burgert, page 11. Irish immigration records cited by Jones and Burgert also indicate that Jeremiah and Anna has a 7-year-old son when he arrived there in 1709. This son may have been Peter. (4) “Early Pennsylvania Pioneers from Mutterstadt in the Palatinate,” page 2. (5) “Early Pennsylvania Pioneers from Mutterstadt in the Palatinate,” page 2. She cites The Tribbeko and Ruperti lists, Board of Trade Miscellaneous Vol. 2, no. D68. (6) “Early Pennsylvania Pioneers from Mutterstadt in the Palatinate,” page 11. She cites “Early Eighteenth Century Palatine Emigration,” by Knittle, Appendix D, page 281. (7) “Early Pennsylvania Pioneers from Mutterstadt in the Palatinate,” page 11. She cites the village church books. (8) “Pennyslvania German Pioneers,” Ralph Beaver Strassburger, page 31. (9) “Palatine Origins of Some Pennsylvania Pioneers,” by Annette K. Burgert, page 156. (10) “Pennsylvania Archives,” Series 3, Vol. 24, page 19. Jeremiah Hess, born in 1751. Maria Hess. Married Jacob Grotz. Elizabeth Hess, bapt. July 23, 1758. Married Jacob Keller. Ann Hess. Married Tobias Scholl. Conrad seems to have been a prominent man in the early history of Northampton County. He served in county government in the mid-1700s and also operated an inn known as Lofty Oaks on the outskirts of Easton. Conrad probably held other positions, but I have not confirmed them. “History of Lehigh County, Pennsylvania” says he was “prothonotary and Clerk of the Quarter Sessions and Oyer and Terminer from 1760 to 1771.” According to a manuscript in the Hess file at the Wyoming Valley Historical Society in Wilkes-Barre, he was appointed to the election board of Northampton County in 1756. Much of the work of the county court may have been done at Conrad’s Lofty Oaks, according to a manuscript in the Hess family file at the Northampton County Historical and Genealogical Society. “The name Conrad Hess Esq. appears on file in the records of the Orphan’s Court of the County of Northampton in Easton, Pa., for the period 1758-1771. Since the court sessions of the county were held in taverns before the courthouse was built in 1766 it is very likely the Loft Oaks tavern served in this capacity during this period,” the item says. Maria probably died sometime before 1790 because Conrad is listed as living alone in the 1790 Census of Williams Township. (1) Conrad’s birth date and parents are listed in “Early Pennsylvania Pioneers from Mutterstadt in the Palatinate,” by Annette K. Burgert, page 11. Conrad is also mentioned as Jeremiah’s son in Philadelphia County Will Book G, No. 73, as cited in “Collections of the Genealogical Society of Pennsylvania, Vol., IV, Abstracts of Philadelphia Wills, Part II, 1726-1747,” page 823. A facsimile of Jeremiah Hess’ will appears in “I Shook My Family Tree,” by Thelma (Hess) Parsons, pages 170-171. Much research has been done on Conrad, but some of it seems to be faulty. Manuscripts at the Wyoming Valley Historical Society indicate that several researchers have confused our Conrad and others of the same name. Conrad’s parentage has been a matter of great dispute. Secondary sources are confusing or conflicting. “Historic Structures of Williams Township,” page 8, says his father was Baltzer Hess. It seems that there was a Baltzer who was his brother. Conrad’s file with the Daughters of the American Revolution says he was born about 1726 to Swiss immigrant Nicholas and Catherine Hess. However, Nicholas’ son Conrad was born in the 1740s, far too late to be our Conrad. The DAR file frequently confuses this Conrad with others of the same name. Concerning his birthplace: I have obtained an abstract and two transcripts of Conrad’s will but have not obtained a copy of the original yet. They are at odds. The will was in German and had to be translated, which probably explains some of the confusion. Conrad was a resident of New Britain Township, according to a transcript in a manuscript focusing on the Hess family, which is available at the Wyoming Valley Historical Society in Wilkes-Barre, Pa., and “Abstracts of German Script Wills,” page 117, which is available at the Marx Room in the Easton Public Library. (2) Wedding and birth dates and maiden name come from “A History of the Wapwallopen Region,” by the Wapwallopen Historical Society, page 54. Other secondary sources cited here mention the connection to the Best family. (3) The children are listed in Northampton County Will Book 3, page 119, and in Northampton County Deed Book, E-2, page 143, the second of which lists the married names of the females, except Ann. The females’ husbands are named in “History of Lehigh County, Pennsylvania,” by Charles Rhoads Roberts, page 566. Elisabeth’s baptism is listed in “The Record Book of Daniel Schumacher 1754-1773,” translated by Frederick S. Weiser, Page 77. (4) Source for posts are, respectively: “History of Northampton, Lehigh, Monroe, Carbon and Schuylkill Counties,” by I. Daniel Rupp, page 22; “Pennsylvania Archives,” Series 2, Vol. 9, page 812; Northampton County Orphan’s Court Records B 1758 to 1762; and “Colonial Records of Pennyslvania,” Vol. 7, page 769. (5) “Northampton County Tax List for the Year 1761,” by the Works Progress Administration, page 25A. (6) “Genealogical Abstracts of Orphan’s Court Records, Northampton County, Pennsylvania, Vols. A-E 1752-1795,” by Candace E. Anderson, pages 7-24. (7) By Northampton County Deed Book E-2, page 143. Patent in Pennsylvania Patent Book 28, page 398. (8) “Historic Structures of Williams Township,” by the Williams Township Bicentennial Committee, page 8. (9) “Pennsylvania, Tax and Exoneration, 1768-1801,” available at Ancestry.com. (10) “The Record Book of Daniel Schumacher 1754-1773.” (11) Records of the First United Church of Christ in Easton, available in “Pennsylvania, Church and Town Records, 1708-1985,” via Ancestry.com. The German-script records say he died in Wilhelms township and was 82 year, 3 months and 22 days old. John Hess, born July 20, 1776. Jacob Hess, born March 10, 1778. Magdalena (Polly) Hess, born March 23, 1780. Married Christian Stoudt. Abraham Hess, born Oct. 10, 1781. Anna (Nancy) Hess, born Oct. 6, 1783. Married Jacob Bauer. Elizabeth Hess, born Sept. 10, 1787. Married Philipp Readler. William Hess, born Feb. 14, 1789. Jeremiah Hess, born Nov. 19, 1791. Rachel Hess, born Oct. 19, 1794. Married Jacob Harter. Maria (Mary) Hess, born Feb. 3, 1797. Married Conrad Snyder. Margaret (Peggy) Hess, born March 17, 1800. Married John Berger. Lydia Hess, born Nov. 9, 1803. Married Anthony Walp. Susannah, married a man named Knorr. Sarah Hess, born 1810. Married Michael Raber. Jeremiah grew up in Williams Township, Northampton County, where his father held several government offices and owned an inn known as Lofty Oaks. Jeremiah served in the Northampton County Militia during the Revolution. He first appears in “Pennsylvania Archives,” as a private in an undated muster roll from Capt. Frederick Kleinhantz’s company in the county militia’s 1st Battalion. Upon moving to Luzerne County, Jeremiah probably took up farming because Nescopeck Township was very rural and probably couldn’t support a mason. He seems to have been successful because he had acquired more than 910 acres by the time of his death. Jeremiah, Elizabeth and Susannah are buried Old River Church Cemetery in Wapwallopen. (1) Parents named in Conrad’s will, Northampton County Will Book 3, page 119. Year comes from a photo of Jeremiah’s tombstone, which appears in “A History of the Wapwallopen Region,” by the Wapwallopen Historical Society. The birth date was Nov. 19, 1751, according to “Daughters of the American Revolution Patriot Index,” page 325, and “DAR Lineage Book,” see below. (2) The timing for the marriage to Elisabeth is based on the birth of their first child in 1776. The timing for the marriage to Susannah is based on Elisabeth’s date of death. The wives’ approximate birth years are based on their tombstones at Old River Church Cemetery in Wapwallopen, Luzerne County. The surnames appear in “A History of the Wapwallopen Region,” but primary sources have not been found to support this. Susannah’s marriage to Peter Lenhart is supported by a baptismal record that lists Jeremiah and Susannah as sponsors and grandparents of Elisabetha, daughter of Philip Meixell and Catharina, need Lenhart. The record appears at the Luzerne County GenWeb site under “Wapwallopen Union Reformed & Lutheran Church (Old River Church); Baptismal Records 1813 to 1876; Luzerne County, Pennsylvania.” (3) The births and baptisms of John, Magdalena, Abraham, Anna, Elizabeth, Rachel and Lydia are listed in the records of Easton’s First United Church of Christ in “Pennsylvania and New Jersey, Church and Town Records, 1708-1985,” at Ancestry.com. They also appear in “Some of the First Settlers of The Forks of the Delaware and Their Descendants,” by the Rev. Henry Martin Kieffer, pages 96, 109, 111, 115, 122, 132 and 173. In several cases the months listed in the book do not correspond with the months listed in the original document, which appear in images on Ancestry.com. The baptisms of Maria and Margaret are listed in “Church Record of the Plainfield Reformed Church, Plainfield Township, Northampton County, Pa. Vol. I,” compiled by W.J. Hinke, pages 38 and 44. All of Jeremiahs’ surviving children and the surnames of some the married daughters are listed in property records covering the sale of Jeremiah’s estate by his heirs. The sale is mentioned in Luzerne County Deed Book 22, page 611; and Deed Book 27, page 110. These records related to property sold by Jeremiah’s heirs. The name of Lydia’s husband comes from the 1850 Census of Briar Creek Township, Columbia County, Pa. Most of the husbands’ full names are listed in baptismal records from “Wapwallopen Union Reformed & Lutheran Church (Old River Church),” which is available on the Luzerne County GenWeb site. The birth dates of Jacob and William are listed on their tombstones recorded at “Wapwallopen Cemetery,” which is available at the Luzerne County GenWeb site. The birth dates of Jeremiah and Sarah are available at FindaGrave.com, where photos are available of the tombstones, and are supported by census records. (4) “Pennsylvania Archives,” Series 5, Vol. 8, pages 89, 349, 361 and 565. Also listed in “DAR Lineage Book,” Vol. 131, page 285; Vol. 133, page 221; Vol. 155, page 301. (5) “History of the Lehigh Valley,” page 110. (6) Tax lists in “Pennsylvania Archives,” Series 3, pages 86, 187 and 293. Church records in “Some of the First Settlers,” pages 78 and 79. (7) Land purchase in Northampton County Deed Book B-2, page 464. Lofty Oaks sale in Northampton County Deed Book A-3, page 143. Mentioned as innkeeper in “Historic Structures of Williams Township,” by the Williams Township Bicentennial Committee, page 8. (8) Land sale in Northampton County Deed Book H-3,page 342. Land purchase in Luzerne County Deed Book 10, page 19. (9) “History of Luzerne County, Pennsylvania: With Biographical Selections,” Volume 1, by Henry C. Bradsby, published in 1893, page 541. (10) Dates of death for both wives come from “Wapwallopen Cemetery,” at the Luzerne County GenWeb site. (11) Jeremiah and Susannah are listed as grandparents and sponsors at the baptism of the Meixell’s daughter, Elizabeth, in 1817, as listed at the Luzerne County GenWeb site under “Wapwallopen Union Reformed & Lutheran Church (Old River Church); Baptismal Records 1813 to 1876; Luzerne County, Pennsylvania.” (12) Date of death comes from “Wapwallopen Cemetery,” at the Luzerne County GenWeb site and from photo of tombstone in “A History of the Wapwallopen Region.” Jeremiah left no will but letters of administration were granted Nov. 9, 1819 to two of his sons. They are recorded in Luzerne County Deed Book 21, page 431. 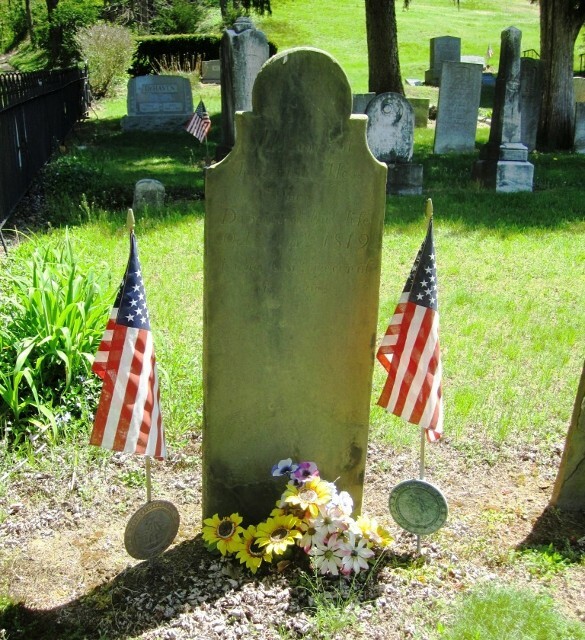 Grave of Jeremiah Hess in Wapwallopen, Luzerne County, Pa.